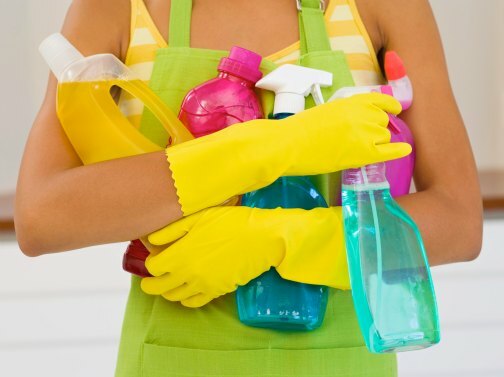 Although cleaning and de-cluttering are never on anyone’s list of favorite household activities, they are two of the easiest and most efficient ways to give home value an immediate boost. Also, they are both relatively inexpensive, so you can be sure the return on investment and time is well worth the effort. A good cleaning of windows, doors, floors and any area a potential homebuyer is bound to look will show that you have made a continued investment to maximize the livability and preserve the longevity of the home. De-cluttering will immediately bring a sense of calm and order to any space, and it will also help your home show to its full potential and automatically make it easier to keep clean as well! Natural cleaning materials. A harsh chemical smell doesn’t always mean clean, so many of today’s "green" cleaning products are free of ammonia, parabens, artificial colorants, phosphates and are also biodegradable. They are infused with enzymes, citric acids, natural oils and more, which do just as good of a job at cleaning the home while producing a safe environment. Custom organizers. Organization systems can be custom-ordered for a Do-it-yourself project suitable for your particular need. Less expensive and complex than hiring a professional, storage and closet organizers and shelving systems are popular for their high-end look and customization, while keeping costs to a minimum. Many times, homeowners can misuse cleaning products or rush the job, leaving the space unclean and potentially germs behind. Not all products work alike and have different directions according to their specific function, so by following the directions exactly as they are listed, you can make sure they are working to their full capacity. When it comes to de-cluttering, ALWAYS start with a plan. Beginning an organization and de-cluttering project without a vision of how it should be completed is a sure way to misplace important items or wind up leaving a job incomplete. For both projects, according to appraisal expert, Leslie Sellers, president of the Appraisal Institute, "any cleaning and de-cluttering job is better than nothing at all." He says that buyers typically "can’t see beyond the initial impression," so this simple fix can essentially mean everything. On a Budget: The easiest way to tackle home cleaning and de-cluttering is to prioritize your time and keep a running checklist of to-dos. Establish a morning and evening routine and also a once-a-week, more robust cleaning and organizing time. By keeping up with cleaning and de-cluttering on a regular basis, it will take less time as a whole and keep chores to a minimum. Mid-Range: If you have carpet, window treatments or hardwood floors that are in desperate need of a deep cleaning, consider renting commercial-grade tools that will get the job done for less than hiring a professional. Steamers and high-end cleaning tools can many times be rented through your local home improvement store by the hour or by the day. High-End: Hiring a professional cleaning team and/or a professional organizer can be a great way to keep your home looking up to par week after week. A professional cleaning team usually brings in a specific number of employees, depending on the size of your home, to address the space efficiently. A professional organizer can help you eliminate clutter in closets, offices, kitchens and any other room that is hidden by disorder and unnecessary materials.